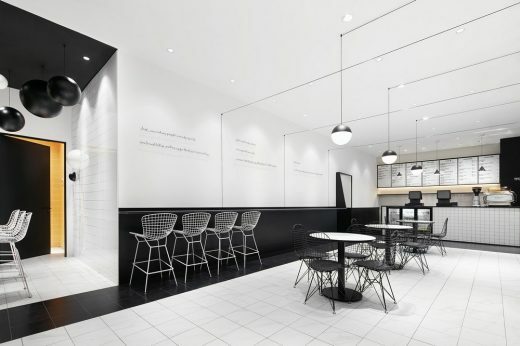 Guangzhou based renowned lifestyle store brand TFD (The Fashion Door) is adding a restaurant to its business, Leaping Creative believes that the space should indicate the brand’s fashion sense and at the same time provide its customers with an unordinary dining experience. 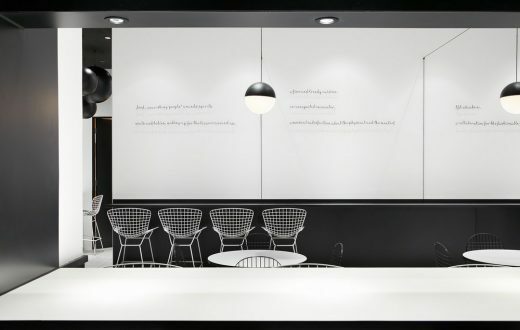 Rather than following the popular trend of industrial or Nordic interior style in China, Leaping Creative is inspired by fashion designers and their love for black and white as well as their trick of using dots, lines and planes. 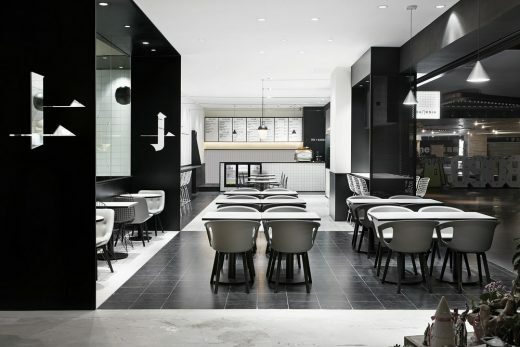 We aim to create a minimalist, intriguing dining space. 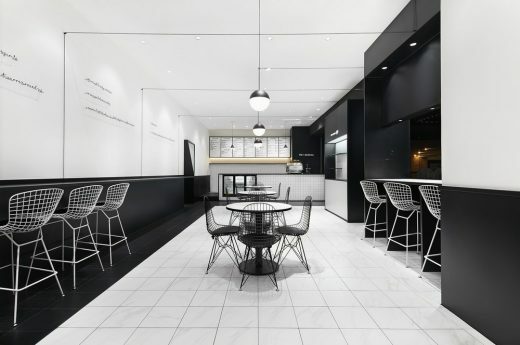 “Our design concept is well carried out from initial sketches to the final outcome, which made it a very interesting design process.” Said Zen Zheng, leading designer of the Leaping team. 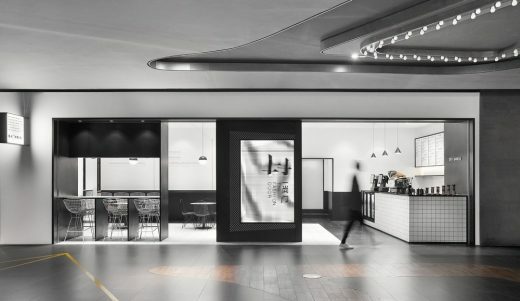 The long extended façade is outlined by the black frames, in which a stereograph is embedded as a signage, presenting the TFD logo with a 3D door image that can be seen both opened and closed by the passers-by. 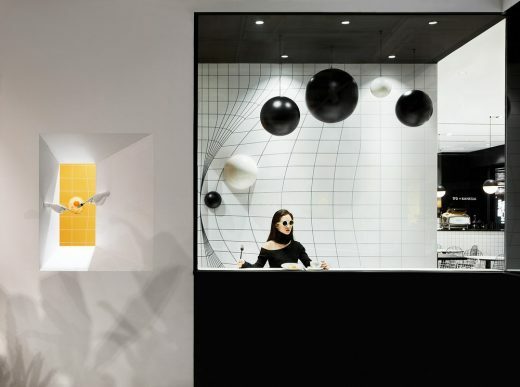 It embodies the brand’s name The Fashion Door, and also creates an external visual focus. 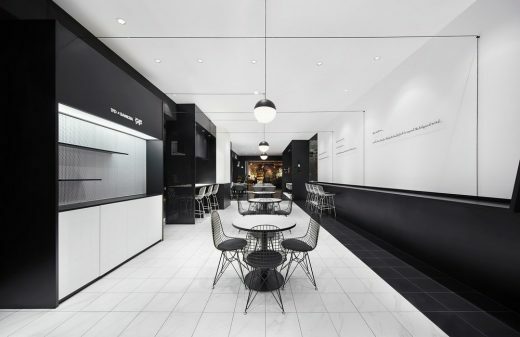 The space is neatly parted by black and white colors, where the two colors interacts with each other in various ways. 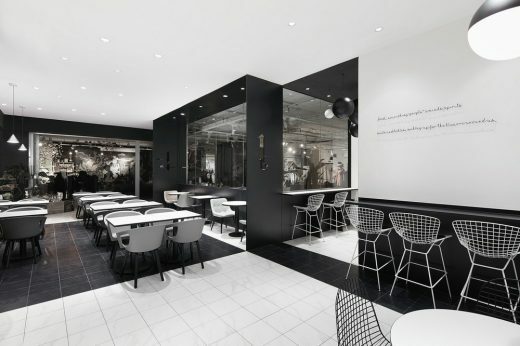 Lights covered with black globes are attached to the white ceiling using ordered black lines, while black wires are bended to form some “fashion quotes” on the white wall. 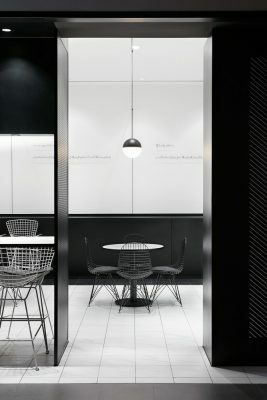 Black partitions created a more private area with the Chinese Logo “门(door)” embodied onto it, and the white mesh pattern of the bar stools and tables dotted the black background with lines and planes. 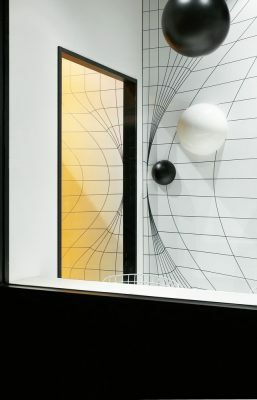 In a secret corner of the restrained space, a group of black spheres floats out of a mysterious door that left unlatched, breaking the structured grid pattern and gradually integrating into the wall, such that we probe into the dialectical relation between the individuals and the world they live in. 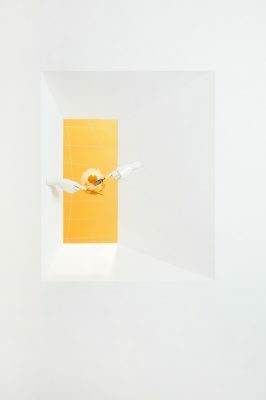 The bright yellow color that appears from the crack inserts in the conceptual scenery of black and white, inferring the existence of a Parallel World hidden behind the door. 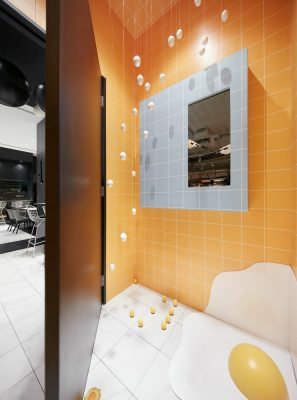 Inside, eggs as the main ingredient of the menu also play the leading role; a ready-to-serve poached egg is fleeing from the dish, yet it is framed by a small window attached with a pair of hand models using folk and knife; so that an unexpected humorous scene can be found on the other side of the window when people wandering about the TFD store.